Online video offers marketers and media firms an immersive and interactive form of communication with targeted user groups. Google is constantly refining its content acquisition and delivery tools to grow its YouTube revenue. 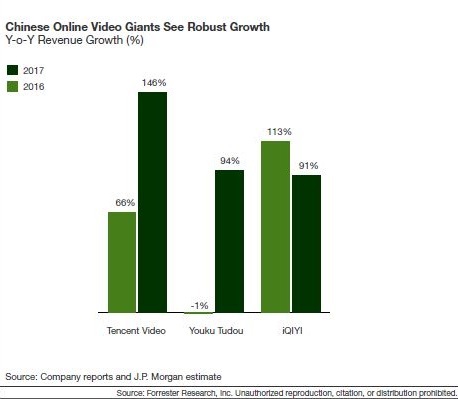 Three Chinese digital giants — Baidu, Alibaba, and Tencent (BAT) — are investing aggressively on their online video platforms, namely Baidu’s iQiyi, Alibaba’s Youku Tudou, and Tencent Video. These companies are seeing an increase in their revenue due to growing average spending per user. Subscription-based, ad-free, unique video content such as Google’s YouTube Premium, Netflix, and Amazon Prime Video is a threat to video advertising spending. These paid users are rapidly growing, signaling a preference among some users for an ad-free viewing experience. Netflix saw a 34% sales increase from last year; it added 6.96 million subscribers between July and September of 2018, surpassing its own estimates. 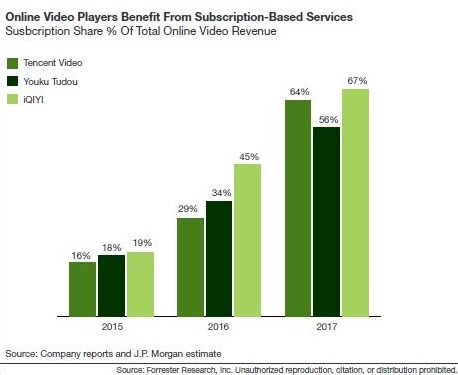 Online video players such as iQiyi, Youku Tudou, and Tencent Video — which provide both subscription-based ad-free service and service along with ads — have witnessed faster increases in revenue and user base via subscription. Online video is a strong driver of online display advertising, but subscription-based service may be preventing it from realizing its full potential in the advertising space. While we hope online video will continue to be a key driver for online display advertising for the next five years, video subscription services will surely cannibalize and put a dent in the advertising growth story over the longer term.